Jimmy Ringo: What about this? Ain't some of you fellas in charge of this donkey? Q: Why does the sheriff have a spur on his left boot, but not on his right one? Is this a goof or deliberate? THE GUNFIGHTER is the seventh western movie I've watched in the last couple of weeks in my quest to catch up with a bunch of films I've never seen that I recorded from TV. And I've made sure I've posted a review as I viewed each for the first time. 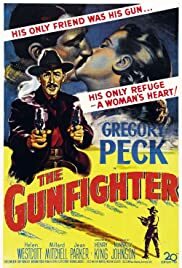 THE GUNFIGHTER is another superb western from a director not normally associated with the genre. Falling squarely between the 1940s and 1950s, I was at first uncertain at to which camp this film fell into. It has all the incidents you'd expect in a 1940s oater, but overlaid with the kind of psychology and sensibilities you'd expect in a 1950s western. In the end, I decided this is a film about contrasts. The next telling contrast is between Ringo and his old compadre, Town Marshall Mark Street. While Ringo still drifts from town to town, occasionally having to show some punk who's fastest, Mark has gone respectable and settled down. Mark is a respected citizen while Ringo's presence causes mothers to call their children indoors. Then there's the contrast between Peggy, Ringo's estranged wife, and the gossipping, prejudiced biddies of the town. Is it any coincidence that Peggy is a teacher, representing education and, by implication, civilisation? THE GUNFIGHTER is very tightly plotted at just 85 minutes. It seems longer because of the wealth of incident it packed into its slender running time. Film makers of today could learn a lot about how to pace a story from films like this. If it shows up on TCM or somesuch satellite/cable channel, do yourself a favour and make the effort to catch it. It's well worth your while.